England produced four contrasting performances to draw 2-2 with the West Indies in the recent ODI series. ...and one of the most frustrating at the same time. The tour of the Caribbean was the last real opportunity for Eoin Morgan’s side to fine-tune their preparations for the World Cup in just a couple of months time. A chance to try new players and work on fresh tactics...if the latter is even such a thing in English cricket. If anything, the five-match ODI series that concluded 2-2 only served to show the true Jekyll and Hyde legacy of the current generation of talent. A team capable of easing to 400 but also susceptible to being bowled out in half of their allotted overs. England can beat anyone, even themselves. The visitors had been stunned in the Test series, defeated 2-1 despite being heavy favourites, even after they lost the opening contest. Not ideal for Ashes preparation but the ODI series was a chance to show the globe that England are real contenders for the World Cup in a huge summer of cricket. Fuelled by Chris Gayle, who struck the first 135 of his incredible 424 runs across just four matches, West Indies set England a competitive total of 360. 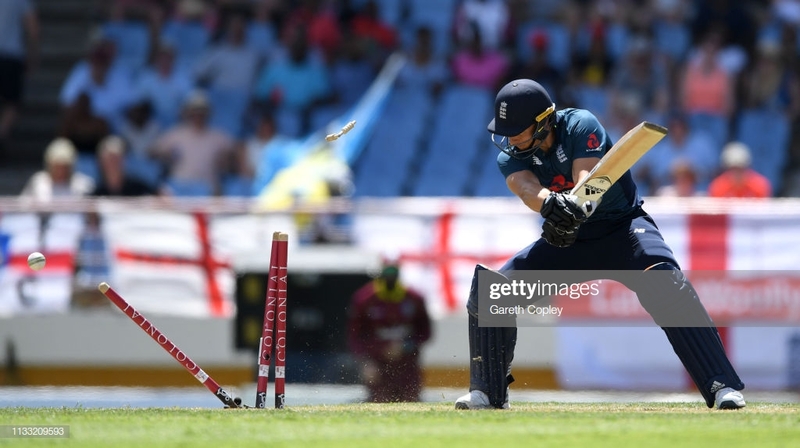 Yet an aggressive but measured approach from Jason Roy combined with an excellent innings-building display from Joe Root ensured the tourists drew first blood. Unfortunately, there was not enough of the those types of performances in the games to come. ...England were bowled out for just 263, around a century short of the total they posted at the same ground only two days previous. Morgan and Ben Stokes showed some class in their half centuries but too many players got themselves out through a lack of concentration, heaping needless pressure on the players below them. Whilst Windies reacted and adapted to a different wicket, it was the first sign of England’s one-dimensional approach haunting their progression once again. After the third contest was abandoned, England put things right in the fourth match to ensure they could not be defeated. This time the attacking approach worked with Jos Buttler’s rapid 150 propelling England over 400 - only the 20th time a nation had produced such a score. However, the tourists did almost self-destruct. Again Gayle was the instigator, unlocking weaknesses in the England bowling attack. A lack of pace was showing with only Mark Wood bringing any sort of sustainable threat. Everyone else was too easily picked off at 10mph slower than the Durham seamer. Had it not been for some rash decisions by the likes of Hetmyer and Carlos Brathwaite when well set to push the run chase close, Windies could have pulled off one of the greatest shocks in ODI history. And it wasn’t just the England seam attack having issues. Whilst Adil Rashid picked up four wickets in the final over, Moeen Ali was into his third game and 19th over without a wicket...at a cost of 167 runs. Clearly a man short of confidence. Onto the final contest and the chance for England to wrap up the series. Perhaps somewhat arrogantly, the tourists appeared to feel they could smash their way to victory again - they were bowled out for a mere 113, losing eight wickets to catches after further dreadful decisions. It’s a familiar problem that is plaguing England in Test matches, along with the shorter formats of the game. If early wickets tumble, the middle order rarely change tactics to put together a more conservative partnership when it is needed most. Collapses have been a feature of the English game for decades and the same one-dimensional approach in the modern era remains - hit out or get out. With Gayle leading the charge again, Windies picked off the total in just 73 deliveries - the fastest ever defeat for an English team. Two excellent batting displays, reflected by two dreadful collapses. England need to look long and hard at how they approach matches before the World Cup begins in three months time. Slogging will only get you so far. Similarly, what England’s bowlers lack in pace must be made up for in guile and adaptions. Wood and Rashid are the only players who can hold their heads high with ball in hand, the former because his sheer speed caused so many issues and the latter showcasing his hard to pick spin bowling. Fortunately, West Indies are like England...hit out or get out. Unfortunately, there are several more tactically astute teams awaiting at the World Cup.